I think I've read most of Sally Clarkson's books and really have enjoyed them, especially, The Ministry of Motherhood. Wow. 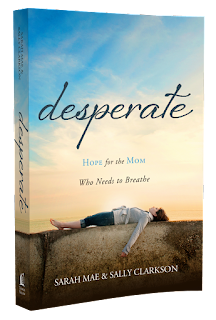 What an encouraging, challenging book for all mothers to read. I'm looking forward to reading her new book, Desperate. The launch of her book and all the fun giveaways are posted today on her blog! Head on over to see what it's all about.